I am interested in ways to improve or come up with algorithms that are able to solve the Travelling salesman problem for about n = 100 to 200 cities. The wikipedia link I gave lists various optimizations, but it does so at a pretty high level, and I don't know how to go about actually implementing them in code. There are industrial strength solvers out there, such as Concorde, but those are way too complex for what I want, and the classic solutions that flood the searches for TSP all present randomized algorithms or the classic backtracking or dynamic programming algorithms that only work for about 20 cities. So, does anyone know how to implement a simple (by simple I mean that an implementation doesn't take more than 100-200 lines of code) TSP solver that works in reasonable time (a few seconds) for at least 100 cities? I am only interested in exact solutions. You may assume that the input will be randomly generated, so I don't care for inputs that are aimed specifically at breaking a certain algorithm. 200 lines and no libraries is a tough constraint. The advanced solvers use branch and bound with the Held–Karp relaxation, and I'm not sure if even the most basic version of that would fit into 200 normal lines. Nevertheless, here's an outline. One way to write TSP as an integer program is as follows (Dantzig, Fulkerson, Johnson). 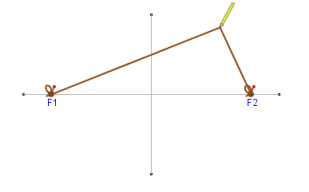 For all edges e, constant we denotes the length of edge e, and variable xe is 1 if edge e is on the tour and 0 otherwise. For all subsets S of vertices, ∂(S) denotes the edges connecting a vertex in S with a vertex not in S.
Condition 1 ensures that the set of edges is a collection of tours. Condition 2 ensures that there's only one. (Otherwise, let S be the set of vertices visited by one of the tours.) The Held–Karp relaxation is obtained by making this change. Held–Karp is a linear program but it has an exponential number of constraints. One way to solve it is to introduce Lagrange multipliers and then do subgradient optimization. That boils down to a loop that computes a minimum spanning tree and then updates some vectors, but the details are sort of involved. Besides "Held–Karp" and "subgradient (descent|optimization)", "1-tree" is another useful search term. By "partial solution", I mean an partial assignment of variables to 0 or 1, where an edge assigned 1 is definitely in the tour, and an edge assigned 0 is definitely out. Evaluating Held–Karp with these side constraints gives a lower bound on the optimum tour that respects the decisions already made (an extension). Branch and bound maintains a set of partial solutions, at least one of which extends to an optimal solution. The pseudocode for one variant, depth-first search with best-first backtracking is as follows. The idea of branch and bound is that there's a search tree of partial solutions. The point of solving Held–Karp is that the value of the LP is at most the length OPT of the optimal tour but also conjectured to be at least 3/4 OPT (in practice, usually closer to OPT). The one detail in the pseudocode I've left out is how to choose the branching variable. The goal is usually to make the "hard" decisions first, so fixing a variable whose value is already near 0 or 1 is probably not wise. One option is to choose the closest to 0.5, but there are many, many others. Java implementation. 198 nonblank, noncomment lines. I forgot that 1-trees don't work with assigning variables to 1, so I branch by finding a vertex whose 1-tree has degree >2 and delete each edge in turn. This program accepts TSPLIB instances in EUC_2D format, e.g., eil51.tsp and eil76.tsp and eil101.tsp and lin105.tsp from http://www2.iwr.uni-heidelberg.de/groups/comopt/software/TSPLIB95/tsp/. If your graph satisfy the triangle inequality and you want a guarantee of 3/2 within the optimum I suggest the christofides algorithm. I've wrote an implementation in php at phpclasses.org. As of 2013, It is possible to solve for 100 cities using only the exact formulation in Cplex. Add degree equations for each vertex, but include subtour-avoiding constraints only as they appear. Most of them are not necessary. Cplex has an example on this. You should be able to solve for 100 cities. You will have to iterate every time a new subtour is found. I ran an example here and in a couple of minutes and 100 iterations later I got my results. I took Held-Karp algorithm from concorde library and 25 cities are solved in 0.15 seconds. This performance is perfectly good for me! You can extract the code (writen in ANSI C) of held-karp from concorde library: http://www.math.uwaterloo.ca/tsp/concorde/downloads/downloads.htm. If the download has the extension gz, it should be tgz. You might need to rename it. Then you should make little ajustments to port in in VC++. First take the file heldkarp h and c (rename it cpp) and other about 5 files, make adjustments and it should work calling CCheldkarp_small(...) with edgelen: euclid_ceiling_edgelen. TSP is an NP-hard problem. (As far as we know) there is no algorithm for NP-hard problems which runs in polynomial time, so you ask for something that doesn't exist. It's either fast enough to finish in a reasonable time and then it's not exact, or exact but won't finish in your lifetime for 100 cities. To give a dumb answer: me too. Everyone is interrested in such algorithm, but as others already stated: I does not (yet?) exist. Esp your combination of exact, 200 nodes, few seconds runtime and just 200 lines of code is impossible. You already know that is it NP hard and if you got the slightest impression of asymptotic behaviour you should know that there is no way of achieving this (except you prove that NP=P, and even that I would say thats not possible). Even the exact commercial solvers need for such instances far more than some seconds and as you can imagine they have far more than 200 lines of code (even when you just consider their kernels). EDIT: The wiki algorithms are the "usual suspects" of the field: Linear Programming and branch-and-bound. Their solutions for the instances with thousands of nodes took Years to solve (they just did it with very very much CPUs parallel, so they can do it faster). Some even use for the branch-and-bound problem specific knowledge for the bounding, so they are no general approaches. Branch and bound just enumerates all possible paths (e.g. with backtracking) and applies once it has a solution this for to stop a started recursion when it can prove that the result is not better than the already found solution (e.g. if you just visited 2 of your cities and the path is already longer than a found 200 city tour. You can discard all tours that start with that 2 city combination). Here you can invest very much problem specific knowledge in the function that tells you, that the path is not going to be better than the already found solution. The better it is, the less paths you have to look at, the faster is your algorithm. Linear Programming is an optimization method so solve linear inequality problems. It works in polynomial time (simplex just practically, but that doesnt matter here), but the solution is real. When you have the additional constraint that the solution must be integer, it gets NP-complete. For small instances it is possible, e.g. one method to solve it, then look which variable of the solution violates the integer part and add addition inequalities to change it (this is called cutting-plane, the name cames from the fact that the inequalities define (higher-dimensional) plane, the solution space is a polytop and by adding additional inequalities you cut something with a plane from the polytop). The topic is very complex and even a general simple simplex is hard to understand when you dont want dive deep into the math. There are several good books about, one of the betters is from Chvatal, Linear Programming, but there are several more. The TSP is a bounding problem (single shape where all points lie on the perimeter) where the optimal solution is that solution that has the shortest perimeter. My theory is that if you start pushing in on the elastic band so that the length of band increases by the same amount between adjacent points on the perimeter, and each segment remains in the shape of an eliptical arc, the stretched elastic will cross points on the optimal path before crossing points on non-optimal paths. See this page on mathopenref.com on drawing ellipses--particularly steps 5 and 6. 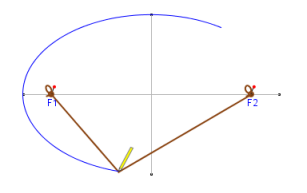 Points on the bounding perimeter can be viewed as focal points of the ellipse (F1, F2) in the images below. What I don't know is if the "bubble stretching" process needs to be reset after each new point is added, or if the existing "bubbles" continue to grow and each new point on the perimeter causes only the localized "bubble" to turn into two line segments. I'll leave that for you to figure out. Not the answer you're looking for? Browse other questions tagged algorithm math optimization graph or ask your own question. Using .permutation to brute-force try every possible path for TSP--is there a faster way? How would you solve this variation of the Traveling Salesman p‌r‌o‌b‌l‌e‌m? What are real-world industry applications of TSP? How to implement a dynamic programming algorithms to TSP in Python?